The 2014 NFL season kicks off with the defending Super Bowl champion Seattle Seahawks hosting Aaron Rodgers and the Green Bay Packers. 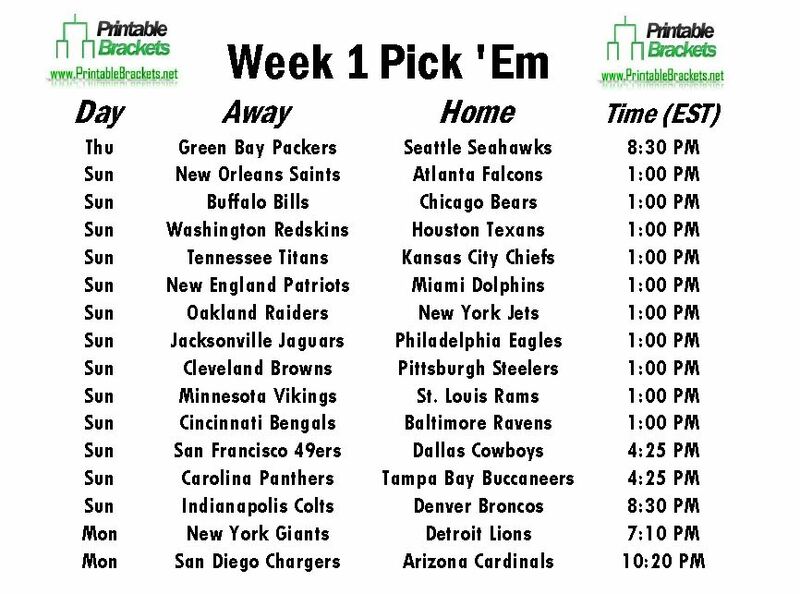 As the season gets ready to kick off, office workers everywhere will be frantically searching for NFL pick em Week 1 printable sheets. Luckily, you can get them for free right here. The annual Thursday night opener is the first game on the 2014 NFL Pick em Week 1 sheet. Seattle enters the 2014 season on the heels of a 43-8 dismantling of the Denver Broncos in Super Bowl XLVIII. Seattle also knocked off the New Orleans Saints and San Francisco 49ers in the NFC playoffs en route to its first Super Bowl title in franchise history. The Seahawks and Packers will be meeting in Seattle for the first time since the now infamous “intertouchdownception” game. In September 2012, replacement referees ruled that Golden Tate caught a game-winning touchdown pass as time expired although replays suggested the ball was actually intercepted. There are a number of other featured games on the NFL pick em Week 1 sheet. In early Sunday action, the Pittsburgh Steelers will host the Cleveland Browns, while the Baltimore Ravens will welcome the defending AFC North champion Cincinnati Bengals. The late Sunday action is headlined by a battle between the 49ers and the Dallas Cowboys in Texas. The first “Sunday Night Football” game of the new season pits Peyton Manning and the Broncos against Andrew Luck and the Indianapolis Colts. The NFL pick em Week 1 sheet features a “Monday Night Football” doubleheader. First, the New York Giants travel to Detroit to take on the Lions. The final game on the NFL pick em Week 1 sheet will see the Arizona Cardinals hosting the San Diego Chargers at University of Phoenix Stadium.